Today most of us live indoors a large portion of our lives – as a good estimate it is around 90%, which we try to shape as comfortable as possible. Thus the indoor environment is a crucial factor for our future development towards a healthy society reaching from childhood to the oldest old. As we try to shape our indoor environment as comfortable as possible we are using resources – mostly energy: for heating, ventilating, cooling, lighting. In the recent years against the background of climate change and energy savings the focus of research and building regulations has been laid primarily on energy efficiency. This has eclipsed the main purpose of indoor environments. A healthy environment contributes much to our societal development: the way we live, learn, work and relax; with all the consequent socio-economic effects on our education, health care and productive working life. 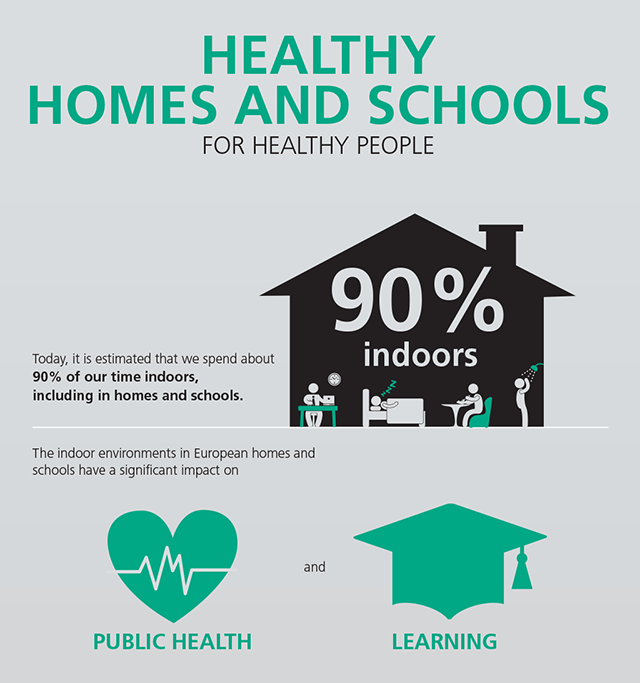 This paper pinpoints key findings from a large literature screening of research on the European indoor environments’ impact on health and performance in homes and schools. The aim is to analyse the relations of indoor environmental effects in homes and schools to health and performance aspects. This serves as basis for a detailed study of the socio-economic impact of the indoor environment as the next step.